Another Monday and yes…another Meme by Strawberry! And one I really had a lot of fun doing, although it took me a while thinking on how and what as the challenge this week is: blog about something that is completely new to you. I decided I wanted a dog! Not breedable or one that needs all kinds of food and supplies, but preferably one that just wanders about a bit and doesn’t ask too much. After some browsing on MP and googling, I found the dogs from VKC (Virtual Kennel Club) looking good and they indeed need no food, it is a one time buy. The VKC has a very informative website (in several languages) which I, as soon to be owner of a dog, of course went through to find out what I could expect. Then I went to the marketplace and found a lovely Dachshund. OK. The price is a bit of a ..bummer, they surely are not cheap (LS 4.800! ), so after some more coffee I hopped over inworld to a VKC dogpark to see some dogs in the pixel. 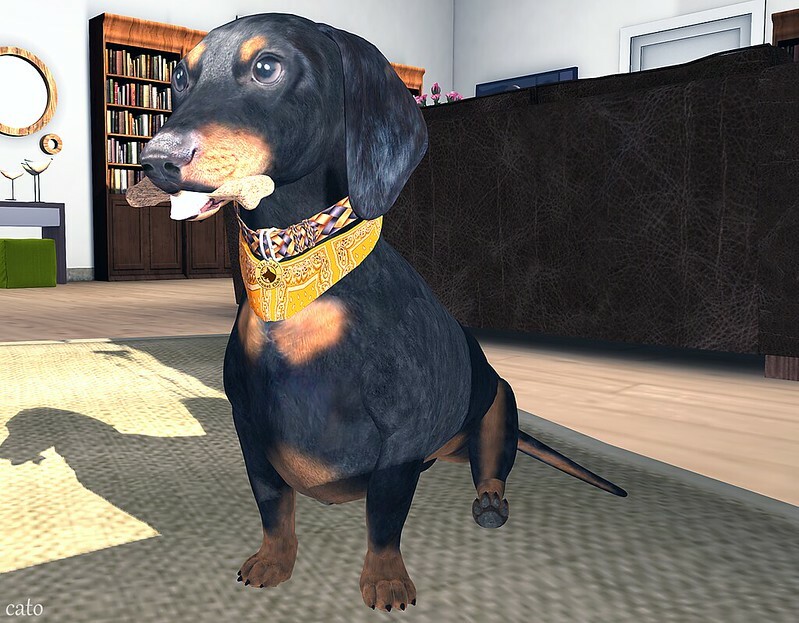 They looked nice and have all kind of nifty tricks, pathfinding, AI and so on and oh well….I bought the Dachshund. 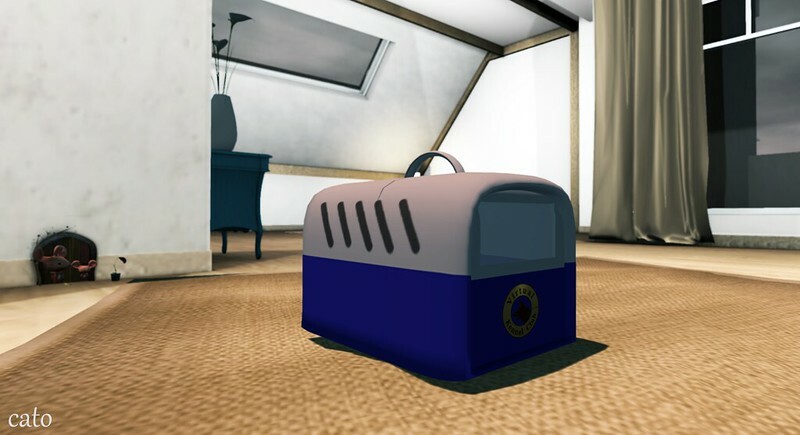 At home I rezzed the Kennel, according to instructions I should not touch it but wait for my dog to be delivered and I was so excited! Within a minute the dog appeared! w000t! And then it poofed and I got an error message. My hund! Poofed! Gone! Nothing in my inventory! Arrrgghhh! Off to the clinic I went, to claim a new version – as the website told me. Alas. Since the failure happened during delivery, of course my hund wasn’t registered yet. The clinic however, has a wonderful system and with a simple ‘help’ in open chat, an approved VKC Trainer was paged and she arrived within a minute. I told her what happened and Renate, the trainer, was sure it was some glitch and she would contact someone else to help me out, but due to timezones this could take a while. Isn’t he adorable? And well made too! I am not quite familiar with all his options and currently, while I am writing this blogpost he is greeting all furniture by name …A bit odd, so I will look into that later..! I have to confess, it is way more fun than I thought it was, I cannot resist petting him – as he comes with such a cute petting animation! Also, I am extremely happy with the wonderful service I got after the disastrous start, Renate has been so patient and helpful, chapeau! Previous Post Behind the scenes of Paradise Lost – Props, props and props! LOL Harvey, I think I do! Hello, they greet everything with scripts in it and avatars that way. If you get tired of it, you can turn it off, and he’ll still go around and wag his tail at things. Command would be “Tango greet-quiet”, and is of course reversible using “Tango greet-verbal”. Rule is: he sees things that have scripts in it, and people, that are roughly in chat range, and moves between them. He greets things he sees, his way of taking notice of things. Hi Augusta, yes he was wearing this when he arrived, I think I can colourchange it, but am not sure yet..I have some playing to do with him! Hi Bine…thanks and I know…he is toooooo cute! Them eyes…and he is even cute when he sleeps!!!!! Hi, Caitlin. My name is Blu Sparkle and I am the VKC Parks Director. I am so delighted you discovered our VKC Dogs. 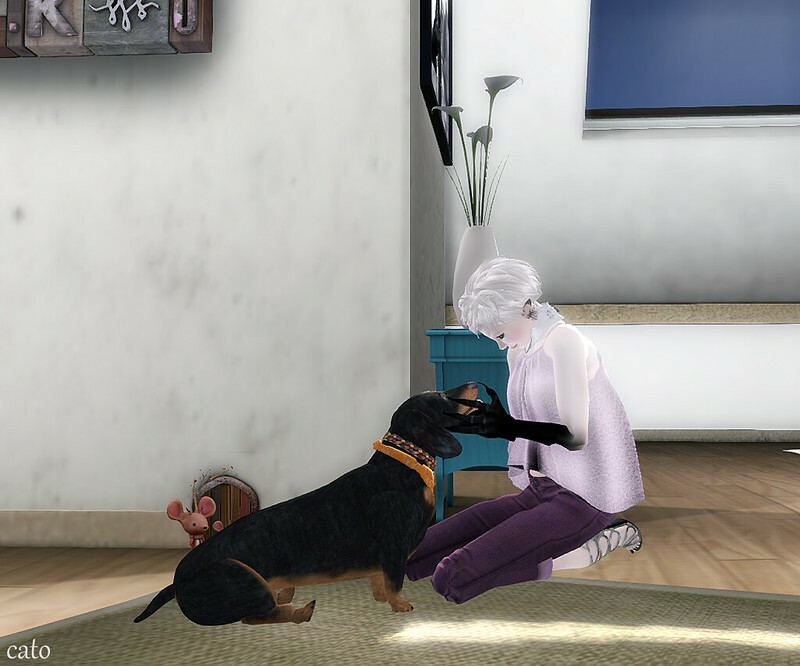 I have been working with the creator and the dogs (and now pets) for about seven and a half of my eight-year SL, and I am still amazed at them and love them as much today as when I bought my very first one. In fact, I love them as much as my RL dogs! The greeting that Tango is doing is actually a tool you can use. He is greeting scripted things and will remember where they are. Once he becomes familiar with his environment, the greeting will become less and less until or unless something or someone new is introduced. The dogs are very inquisitive at first and will tell you what they have discovered about their new home. If the greeting bothers you, you can type in local chat — Tango greet-quiet. He will quit talking so much about everything. Renate is wonderful. We have quite a number of VKC Proven Trainers and they are all wonderful. If at any time you have a question or problem, just go to a clinic and say – help. Or, you can click on our trainer availability board next to the clinic. Trainers who are online and signed in to the board will have their name lit up. Please feel free to IM me at any time you have a question. My IMs go to email and even if I’m at RL work, I can try to find someone to help you. Thanks again for choosing VKC and I know you will enjoy Tango. You’ll be in love and he’ll be your best companion! Thank you so much for the comment Blu! Tango indeed, by now, stopped greeting the furniture..hahah! It’s okay, I will need some time to figure him out, but sofar I am having so much fun having him around! Thanks for the additional information and all the best!! !